John Beckwith (Wilson) and Jeremy Grey (Vaughn), Washington D.C.'s top divorce mediators and lifelong best friends, have never met a wedding they couldn't charm their way into. Guided by a secret set of “wedding crashing rules,” the pair attends a different wedding – and romances different bridesmaids – every week. But, when they crash the social event of the season, John falls for the daughter (McAdams) of an influential and eccentric politician (Walken) and decides to break the “rules” in pursuit of her love. What results is a wild weekend at her family’s palatial estate where the ultimate “crashers” quickly find themselves in way over their heads! 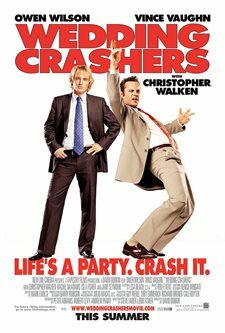 Download Wedding Crashers in Digital HD from the iTunes store. Wedding Crashers images are © New Line Cinema. All Rights Reserved. The Rules of crashing a wedding go something like this: Rule #2: "Never use your real name." Rule #28: "Make sure there's an open bar". Rule #8: "Be the life of the party." Rule #13: "Bridesmaids are desperate: console them." In 2005's hit comedy "Wedding Crashers" Vince Vaughn and Owen Wilson seek to educate us in the fine art of the 115 rules of getting in, getting out, and doing it all over again at next weekend's nuptials to which they have no invitation. The film opens with John (Owner Wilson) and Jeremy (Vince Vaughn) consulting a couple going through a divorce. In typical Vaughn fashion, his fast talking, slick tongued rants for which he has become famous leads the couple to amicably part ways. It is this introduction to the characters that sets the tone for the rest of the film. (Jeremy Grey: Okay, what's our back story? They proceed to be the life of the party, making balloon animals for the children, dancing with the grandmothers, and of course impressing the bridesmaids. The first 30 minutes of the film includes hilarious montages of the various weddings the two attend, and the women they inevitably score. Eventually John (Wilson) begins to question the adolescence of the whole charade (and if you are not a fan of the films actors/frat pack genre, at this point you probably will be having the same questions). Jeremy (Vaughn) convinces him to attend one more wedding, that of the U.S. Treasury Secretaries (Christopher Walken) daughter. In the lavish affair John and Jeremy both get involved with the brides sisters, John uncharacteristically falling for Claire, and Jeremy seducing/being seduced by the younger clingy Gloria. It is at this point the movie takes a turn with Gloria inviting the two back to her fathers estate for the weekend. Jeremy, a stickler for the wedding crashing rules vehemently denies the offer, but John accepts for the both them. The rest of the movie centers on the two trying to live out lies they have created at the wedding party and establishing relationships between the two couples. John and Claire's a somewhat melodramatic romantic story rife with conflict (Claire gets engaged to her longtime boyfriend over the weekend) while Jeremy and Gloria's is a hilarious game of sexual cat and mouse - but who's the cat and who's the mouse? 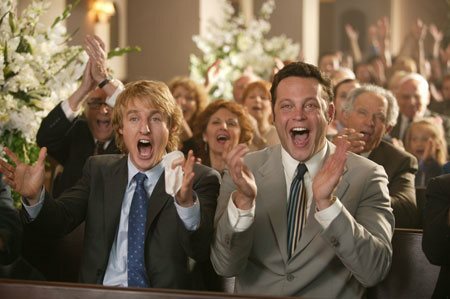 Another successful entry into the frat pack genre of films, Wedding Crashers will have you laughing out loud at the same time feeling for the characters who despite all else stick together until the end. Rule #1: "Never leave a fellow Crasher behind. Crashers take care of their own." 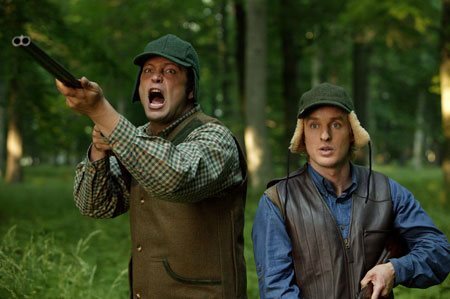 Wedding Crashers images © New Line Cinema. All Rights Reserved.